Here we have miscellaneous car detailing and cleaning supplies including car dusters, car wash mops and detailing aprons. Our dusters feature a braided twist of microfiber filaments. The Autofiber Washstik Car Wash mop makes washing large trucks, SUV's, RV's and campers a breeze. 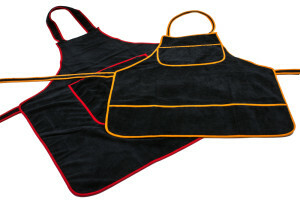 Keep compound and polish off of your cloths, and prevent scratching with our soft microfiber detailing aprons.